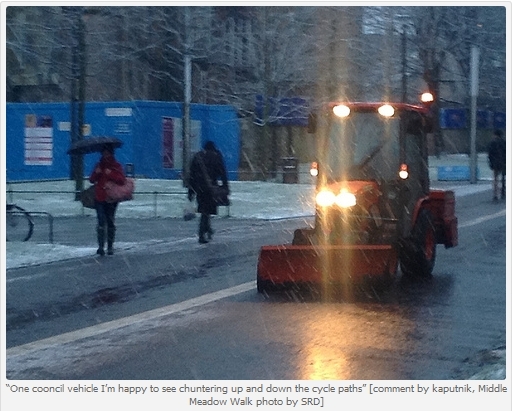 Social media across the UK are full of complaints about ungritted bike paths, but Edinburgh Council has been receiving impressive praise from path users. * Definition of ‘greet’ – if you’re not in Scotland, see here. Of course, there are minor complaints and quibbles, but the overall picture is very positive – and reports of problems sent to the Council’s neighbourhood teams are now also usually quickly dealt with, though obviously prioritising alongside other local reports. The cycle path gritting priorities are listed on the council’s gritting web page and gritting map. Why has this happened in Edinburgh this year?? The new gritting regime is due entirely to the Council’s bold budget decision last year to allocate 5% of the transport budgets (capital and revenue) to cycling (and increasing by 1% annually). Gritting is funded from the revenue budget and so this year, rather than just belated responses to complaints, the Council was able to allocate resources and plan gritting routes well in advance, to cover the main offroad cycleroutes across the city. Edinburgh City Council has set an ambitious target for 10% of all trips, and 15% of commuter trips, to be by bike in 2020 – and their budget decision above followed that up with significant funding. A welcome contrast with the Scottish Government who several years ago set a 10% cycle-use target for 2020, but since then have invested less than 1% of their transport budget in cycling – and even with recent small increases this is still only hovering around the 1% figure. Interestingly, cycle use figures in Edinburgh are rising significantly [see our APPCG submission [pdf 940k] and our traffic counts] whilst in Scotland as a whole they remain static or only rising slowly. What you can do to keep it happening!! If you have benefitted from the new gritting regime, and you’d like it continued in future years, please send your councillors a quick congratulatory/ thank-you email. Find them at www.writetothem.com. Edinburgh will be voting in the next few weeks on its budget for the next financial year, 2013/14. Whilst there was a decision last year to increase the cycle budget by a further 1% a year, that was before the 2012 council elections, and the decision could be reversed. If the council is aware that its policy is effective and is valued by citizens, it is more likely to continue!! [Later] Please retweet our tweet of this article.